There is no provenance on this crazy style patchwork coverlet, but it was found in Melbourne. The fabrics suggest it was made in the post war era, probably 1950s. This style of quilt making is documented in Margaret Rolfe’s books on the traditions and history of Australian quilt making. The coverlet contains a time capsule of dressmaking and home furnishing fabrics from an era when most women stitched clothing for themselves and their families. The fabrics used include ginghams, barkcloth, stripes, checks, double knits, woven houndstooth and many bright floral and geometric designs. The border is a sunny yellow Cesarine. Cesarine was used extensively in the 1950s and 1960s. 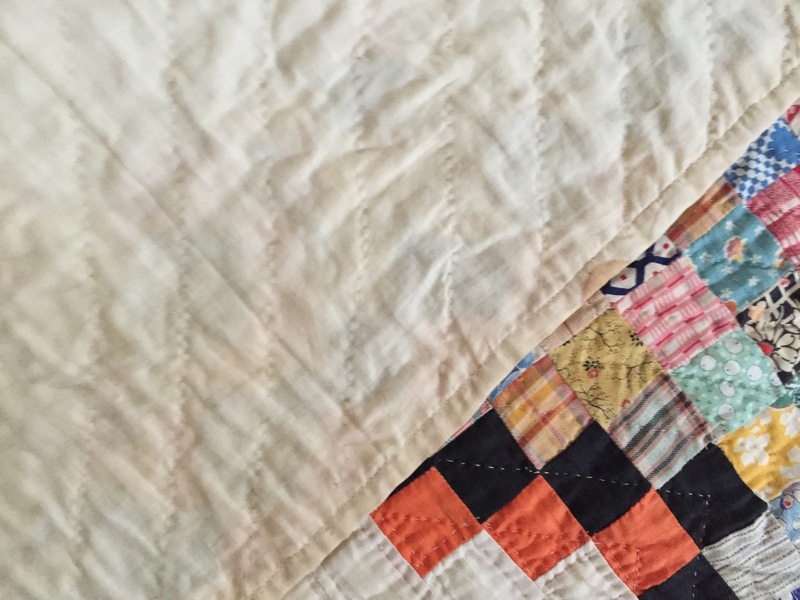 The maker of this quilt carefully turned under the raw edges of her patches and hand tacked narrow hems before overlapping the irregular pieces which she stitched directly onto the one piece of calico backing. The seams are finished with featherstitching. The border was stitched by machine to the right side of the coverlet, neatly folded over and hand sewn to cover the raw edge at the back. It is interesting to study the back of the coverlet which is as neat as the front. The quilt appears to have never been used or washed. This coverlet from Clarence Valley, New South Wales may possibly have been made by the needlewoman who made the coverlet that I documented in the previous post. I purchased this from the same Ebay seller who had bought both of them. Unfortunately, no other information is known. But what we do know is that the coverlet was designed and stitched by an experienced seamstress who had a good array of fabric scraps available to her. Most likely the fabrics were saved from dressmaking. The coverlet is double sided. The coverlet measures 178 x 105 cms. The hexagons measure 7 cm through the centre and 4 cm on the outside edge. The fabrics used in the coverlet include cotton, silk, furnishing fabric, taffeta, sateen and figured satin. The cotton fabrics include many textured weaves and floral prints. One print in particular resembles a Liberty design. The background fabric used on the reverse side may be a wool/rayon mix. It is a heavier weight fabric with a sheen to it. The quilt maker had a flair for colour and design. The colours are very typical of mid 20th century styles and decorating colours. The golds, greens, yellows and browns are artistically used throughout to define the lay-out of the designs on both sides of the coverlet. Side one is pieced with hexagons stitched to form diamond and rosette shapes. The second side uses hexagons stitched to form a large rosette which is stitched to the centre of the brown stripe background fabric. Side one includes the use of brown toned prints to create a border and side 2 makes use of green and orange prints to create the border. The edges of the quilt are neatly whip stitched together to finish the coverlet. There is no batting. The coverlet appears to have never been washed or used. Without further information I can only speculate about the maker of these two exquisite Australian coverlets. They are much treasured by me and I feel very lucky to have them in my collection. Australian quilts are rare and the two Clarence Valley Coverlets demonstrate fine needlework skills and a great flair for design and style. I wish there was more to tell you about the coverlets but sadly their story has been lost. The maker of this coverlet clearly had a vision of her finished design. The hexagons which measure 2 cm on the outside edge were cut with a 2 cm seam allowance. The seams were neatly stitched into place so there was no wrong side of fabric showing. The rosettes consist of 6 hexagons stitched around a solid colour hexagon.The hexagons measure 2 cm on the outside edge. The rosettes measure 10.5 cm. The maker stitched 340 rosettes and set them together in rows of 20 x 17. Two rows – row No. 7 and 14 consist of hexagons stitched in solid colours. These two rows add definition to the design of this lovely scrappy and colourful quilt. The rosettes are joined together with a whip stitch similar to the construction of a yo-yo coverlet. The finished coverlet measures 178 cm x 198 cm. The coverlet appears to have never been used. It is beautifully constructed and a work or art. 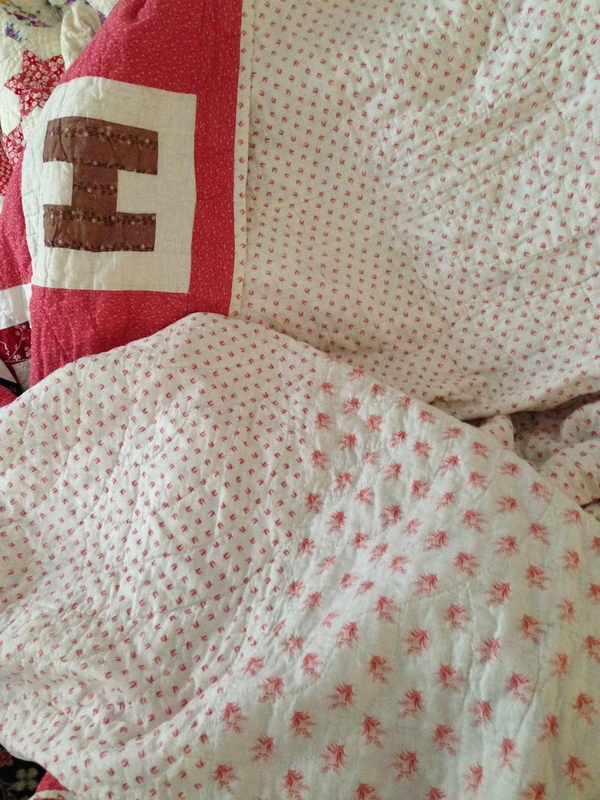 It is one of my absolute favourites and a cherished example of an Australian quilt. 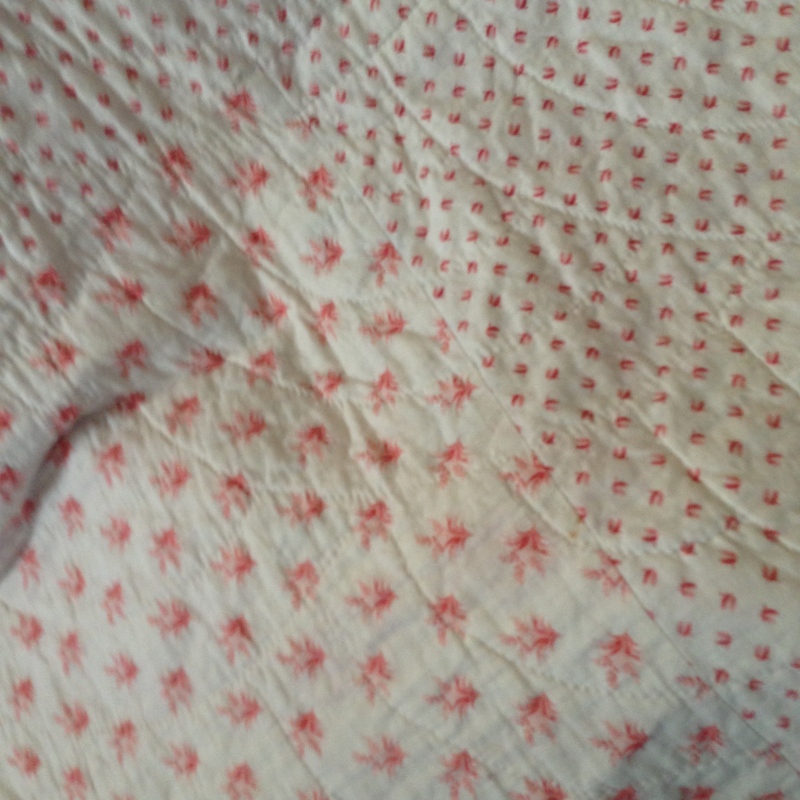 I purchased another coverlet from the same seller which I will write about in my next post. I can only speculate on the maker of this quilt but one thing that stands out to me is her great collection of scraps and her fine needlework skills. 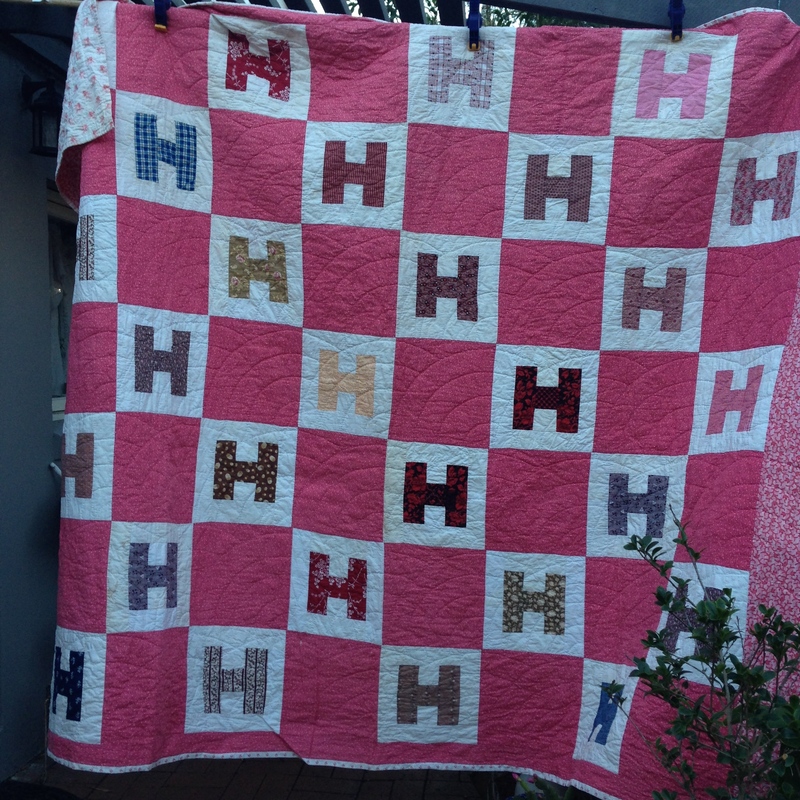 Wagga quilts are an Australian style of quilt born out of hard times and limited resources. Originally waggas or bush quilts were a hessian sack or chaff bag filled with anything that would provide warmth. They may have been covered with an outer cotton fabric. 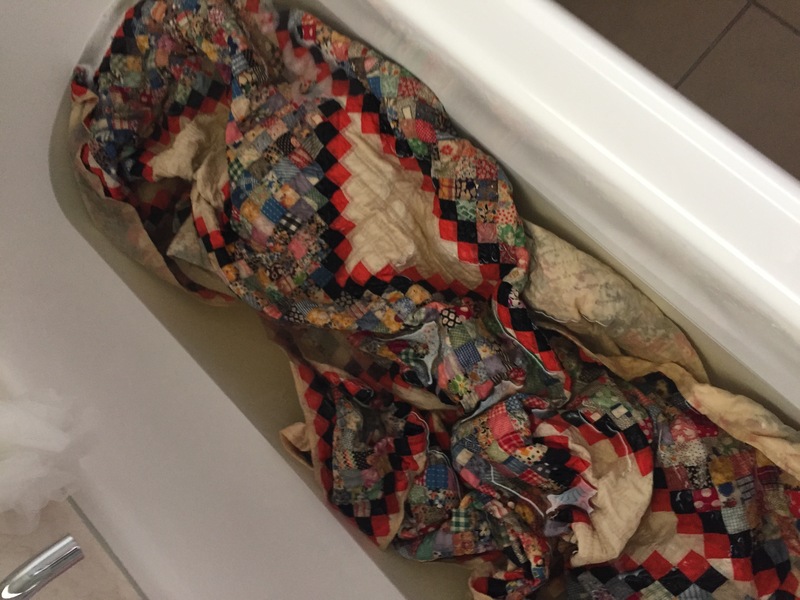 During the Depression Era waggas pieced from woollen tailor’s samples, remains of worn out clothing and dressmaking scraps emerged. The woollen fabrics provided much needed warmth during a period when houses were unheated. My mother recalled her mother making heavy, woollen quilts from tailor’s samples. These were used by her brothers who slept on the back verandah. They were a large family and very poor. I’m sure they appreciated their waggas. I purchased my Wagga on eBay. It was found at a church sale in Charleston, Lake Macquarie, New South Wales. It is in very good condition. I think it may have been placed in a cupboard and forgotten until the church had a big clean up. It appears never to have been used. The quilt is double sided and has an inner layer. It is very heavy. The quilt is in very good condition. There is some machine stitching used to hold the three layers together. There is no binding, indicating the quilt was layered wrong sides together, stitched and turned. There is a great variety of woollen fabric scraps used in the quilt: including tweeds, suitings, khaki army uniform, herringbone, plaids, stripes and checks. A few little moth holes, stitched down pockets and darning all add interest to this unique Wagga. It measures 165 cm x 150 cm. I admire the makers flair and technique in putting together all these pieces. Australian quilts are rare and wonderful and I love having this one in my collection. Two new additions to my postage stamp quilt collection arrived recently. One piece is an incomplete Irish Chain quilt top. The maker had nearly completed the top when something caused her work to be discontinued. Fortunately all the pieces were kept together, including an incomplete row, many extra squares, the little cardboard template and a large piece of muslin. I will complete the row, tidy up some of the piecing and appliqué work and finish the top. I have enough of the plain fabric for the borders and possibly enough cut squares to add another narrow pieced border. The patterned fabrics include florals, plaids, stripes and novelty prints. The maker of this assortment of tiny pieces hadn’t progressed beyond stitching some of her one inch squares into rows. The bundles of pieced sections were rolled into sets and a number was written on the last square to record how many squares are in the row. It appears the maker was planning a particular design but the pattern is not clear to me. The basic square can be arranged in many ways. This could be a simple grid of continuous squares or a more complicated pattern such as Steps to the Altar or Trip Around the World. Two strips of cardboard were sent with the piecework and there is a name written on it, but unfortunately it is too faded to read. The squares measure 1 inch finished size and were hand stitched by an experienced seamstress. The fabrics are dress weight cottons and include novelty prints, floral designs, checks, stripes and geometrics. My two Postage Stamp projects demonstrate how the quilters of the Depression era were able to create beautiful quilts out of so little. It is my intention to complete the work they started – Piece by Piece. I have recently acquired a couple of very sweet old unfinished projects.The first of these is a house block quilt top. It is predominately made from feed sacks and contains plains, florals, plaids and one polka dot. The quilt was not particularly well made and is slightly wonky. Despite this it has a certain charm and as I love feed sack fabrics and house quilts I couldn’t pass it by. I am stabilising the edges by stitching narrow ribbon to the outside edges and easing the blocks onto the ribbon to bring them back to size. I am hopeful that I will achieve a flatter, straight quilt that I can then quilt and finish. The second project that I am working on is a collection of signature blocks. The fabrics used to piece the blocks are typical of the 20s or 30s.Some of the blocks are complete with an embroidered name while others have been signed but not embroidered. The piecework ranges from basic stitching to an expert level. The blocks were not all exactly the same size. With a little trimming I have a working measurement of 12 3/4 inches. I am setting them together with lattice and setting squares cut from feed sack fabric and adding these to each block. When joined this will create a nice scrappy design. The blocks are very charming and include interesting fabrics. These friends made use of fabrics they had on hand and the cream backgrounds include calicos, taffeta and a heavy linen. Nellie ran short of fabric! While peacefully stitching these two projects I am reflecting on the lives of the ladies who made the original pieces. It is lovely to finish a quilt started many years ago. While contemplating the lives of these quilters I am also giving some thought to another little set of blocks. I am waiting for inspiration of how to set these adorable blocks together into a quilt. I will keep you posted. Peaceful Stitching from Janette, The Plain Needlewoman. I purchased this charming old quilt as a ‘cutter quilt’. This is the term used for quilts that are in a very sad condition and can be cut up for small projects with out feeling guilty about cutting up an old quilt. I could see it had potential for salvaging into small keepsake pieces. A heart shape cut from the Darting Birds quilt . When the quilt arrived in the mail, I realised I could not contemplate cutting up this beautiful old quilt. I identified the block pattern in Barbara Brackman’s Encyclopedia of Pieced Quilt Blocks as Darting Birds designed by Nancy Page. 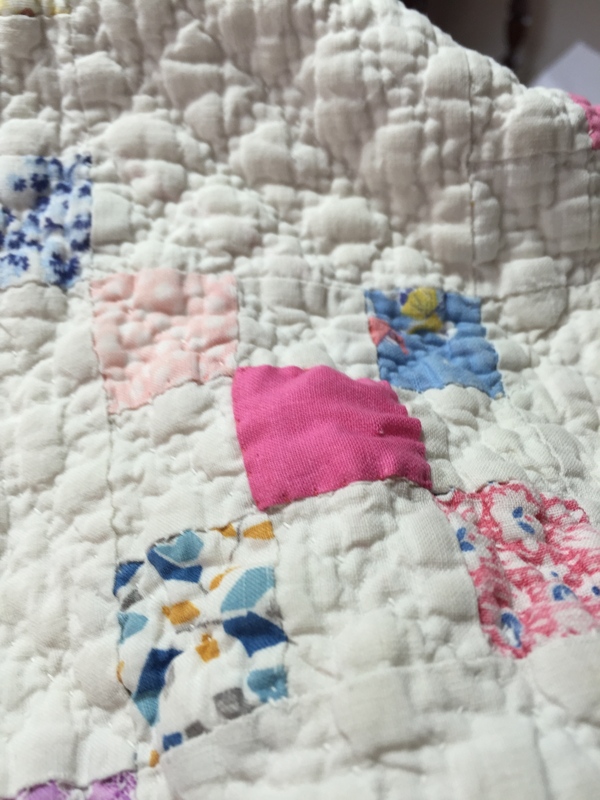 The maker of this quilt had a good collection of fabrics dating from the 1880s to 1900s, including the gorgeous double pink used in the alternate blocks. The birds are pieced from reds, blacks, indigos and browns. The patterns are florals, checks, stripes and polka dots. The backgrounds of the blocks are mostly shirtings. The beautiful backing fabric used on this quilt was a pleasant surprise as the seller had not mentioned this. 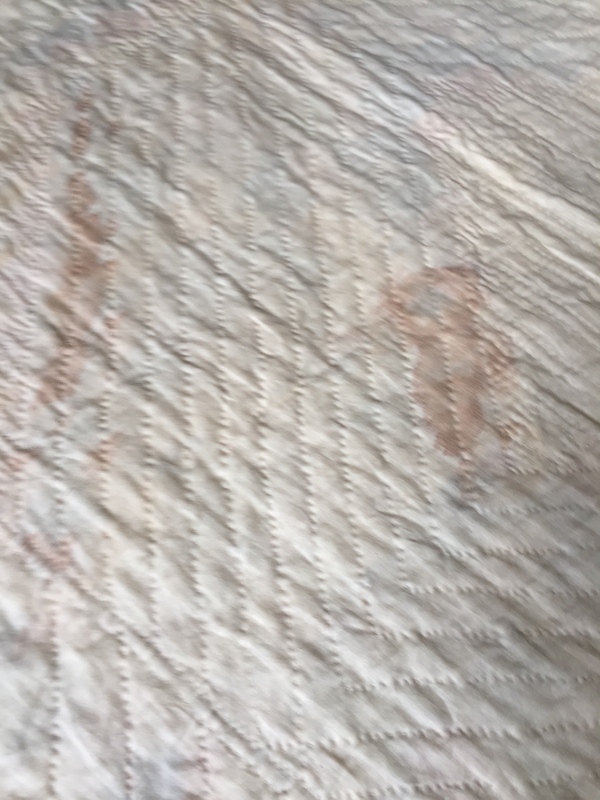 The majority of old quilts have plain muslin backings. Gorgeous backing fabric on display. Obviously made by a skilled needlewoman the piecing is neat and accurate. The hand quilting stitches are tiny and even and the maker chose cross-hatching for her quilting design. Most of the wear on the Darting Birds quilt was on the outside edges. I decided to cut the outside rows off the four sides of the quilt. Removing the damaged area has provided me with some scraps for cutter quilt projects. I stitched a new binding – nice and narrow in keeping with the original. 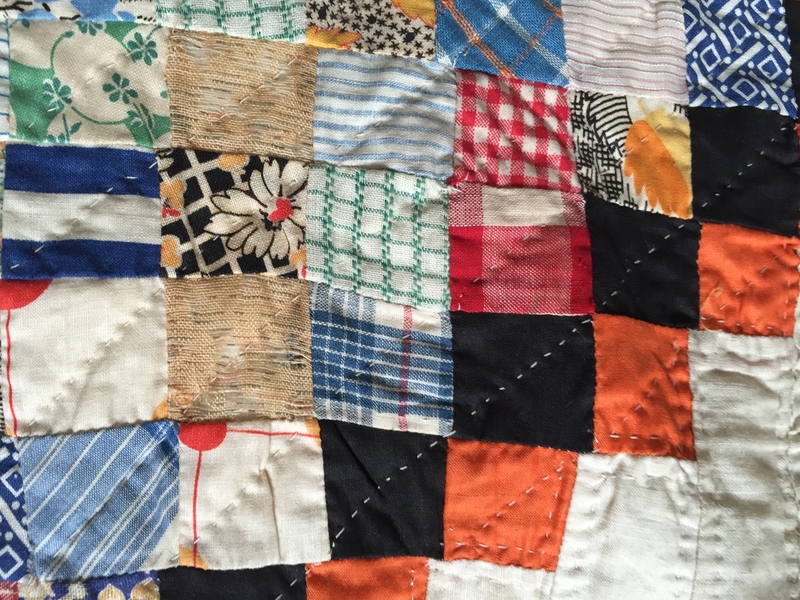 Even though some of the remaining blocks are worn, I can still admire and enjoy this old and obviously much loved quilt. I hope you can too! From Fairy Tales to Ballets, swans have provided ideas and inspiration for many artistic pieces. Swans certainly inspired the creation of this unique quilt. Using fabrics from her feedsack scraps and her fine sewing skills the quilter produced a magnificent example of folk art. Searching through my books and magazines for a pattern source I have been unable to find any patterns for appliqué swans. However, there are many patterns for embroidered swans. Swans were popular motifs for fancy work and examples can also be found on redwork quilts. The maker of the ‘Swans’ may have drawn her own design or found her pattern in a newspaper, magazine or embroidery booklet. The maker had a good collection of feedsack fabrics. There are 21 different patterns used in the quilt and the yellow solid backing fabric may be a plain feedsack fabric. There are 25 blocks. The quilt is finished with three borders – two of feedsack prints (also used for swans) and the final border is plain homespun. The swans and the lily pads are appliquéd with turned under edges and embroidered with stem stitch. Further details are embroidered. The embroidery and quilting is very well executed. 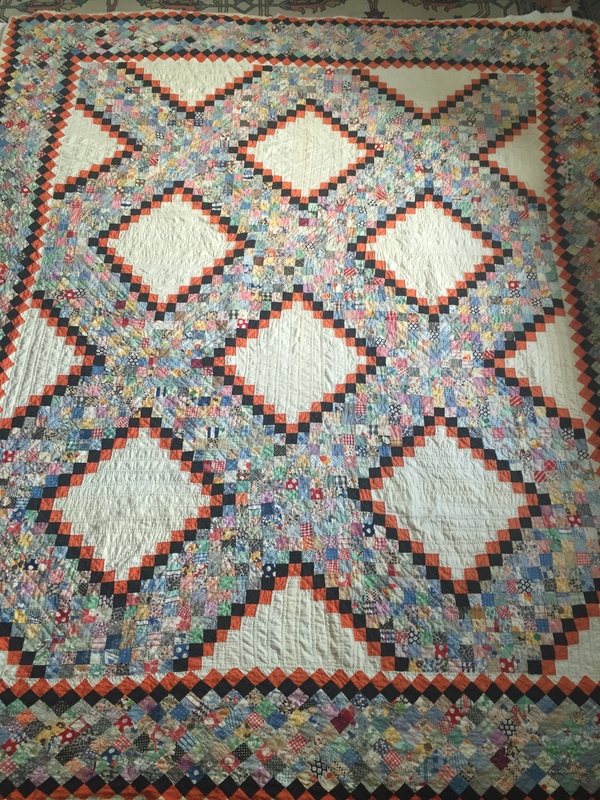 The maker used a soft batting and the quilt displays traditional quilting designs. Cross-hatching was stitched across the blocks and a beautiful feather design was chosen for the border. As a collector of old and vintage china swans this quilt is a favourite of mine. I hope you enjoy seeing it. Two new Postage Stamp quilts have recently been added to my collection. Postage Stamp Quilts are quilts made with very small scraps of fabric. One inch squares are common but sometimes the quilter cut her squares even smaller. At this time in quilting the seam allowance was smaller than the standard quarter inch seam that we use today. The designs vary from a one patch layout to more elaborate settings. Solid fabrics in complimentary colours were often used to set off myriad pieces selected from the scrap bag. 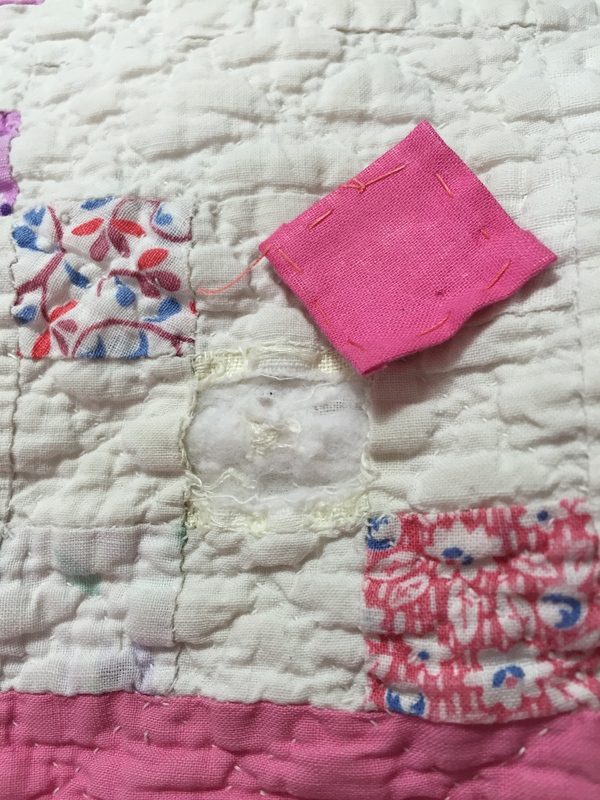 The tiny squares may have been cut from worn clothing, household linens and the scraps left over from other quilt making projects. Postage Stamp quilts offer a wonderful opportunity for fabric study and sometimes older fabrics from other eras can be identified. With its hot pink border this pretty little crib quilt remains bright, clean and colourful. The solid pink and white fabrics are in excellent condition. However, some of the squares were completely worn away. The quilt is beautifully quilted in half inch cross hatching. To repair the worn squares I cut a square of paper to size and tacked fabric onto the paper square, as you would for paper piecing. I pressed the patch well and removed the tacking and the paper. The patch was applied to the damaged area and neatly stitched into place. I then quilted over the newly patched area. This dear little quilt measures 42 x 52 inches with the nine patch blocks measuring 3 inches square. It appears to have been made in the 1930s and may well have been used by many babies. I am sure it was much used and loved. Steps In The Flower Garden circa 1930s. Using the same method as for the Crib quilt, I repaired this wonderful example of a Postage Stamp Quilt. I soaked the quilt in Retro Wash for a day with a colour catcher added in case of colour run. After a good old soak it was into the washing machine and onto the line for some fresh air and sunshine. This quilt has a very light wool batting. The quilting is simple diagonal and horizontal line quilting. The quilt is large, measuring 76 x 88 inches. I am very happy to report that the quilt washed extremely well. The quilt is fresh and clean with the stain removed. 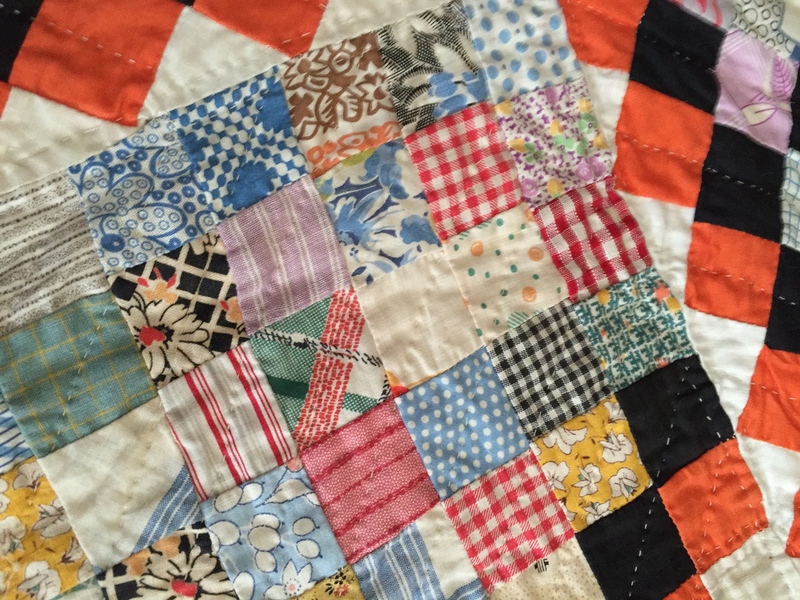 I love this quilt with the vibrant black and orange solid fabrics unifying the many patterns and colours of the scrap pieces used by its maker. Detail of quilt. I hope my Stitches in Time will save these quilts for many more years and they can be studied and enjoyed by all those who see them. Thank you for visiting, Janette The Plain Needlewoman. It’s Never Too Late To Mend. 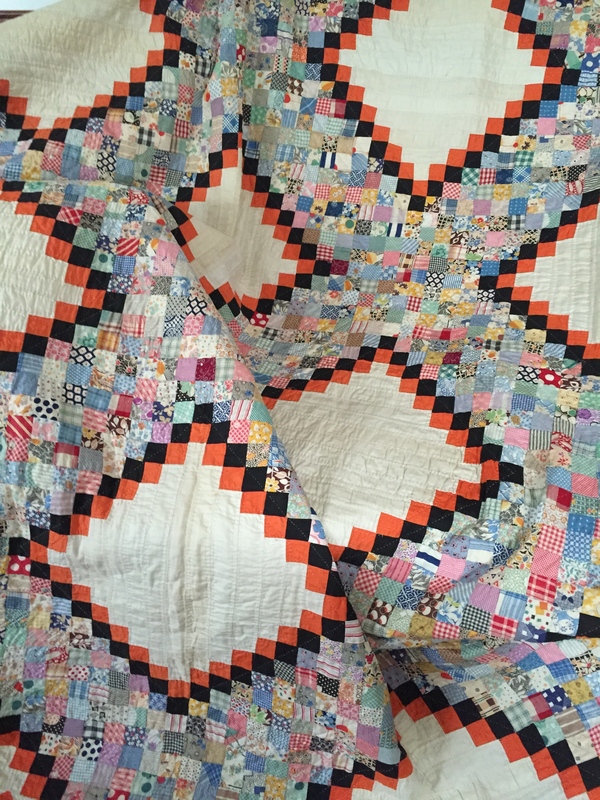 This gorgeous late 1800’s quilt arrived from America in good condition bar a 2 inch tear in one of the H blocks. As the general condition of the fabrics is excellent I can only presume that the quilt caught on a sharp object that caused the tear. 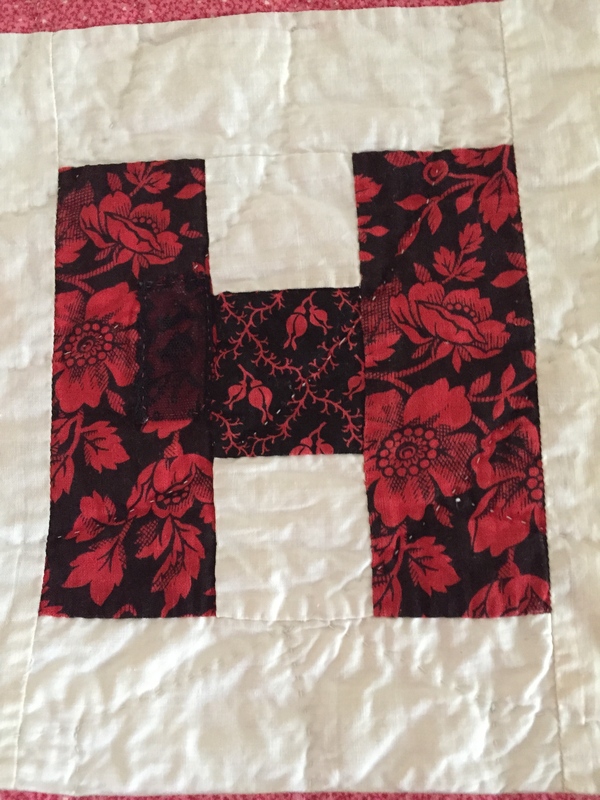 I sorted through my reproduction fabrics for a match to repair this block but could not find a suitable tone of red and black. I thought about using black tulle but didn’t have any on hand. I then remembered that I had some old black lace in my lace collection. I stitched the damage section of the quilt back onto the batting and covered the exposed area with the lace. This was an easy solution and the tear is practically invisible. I am happy with the result. 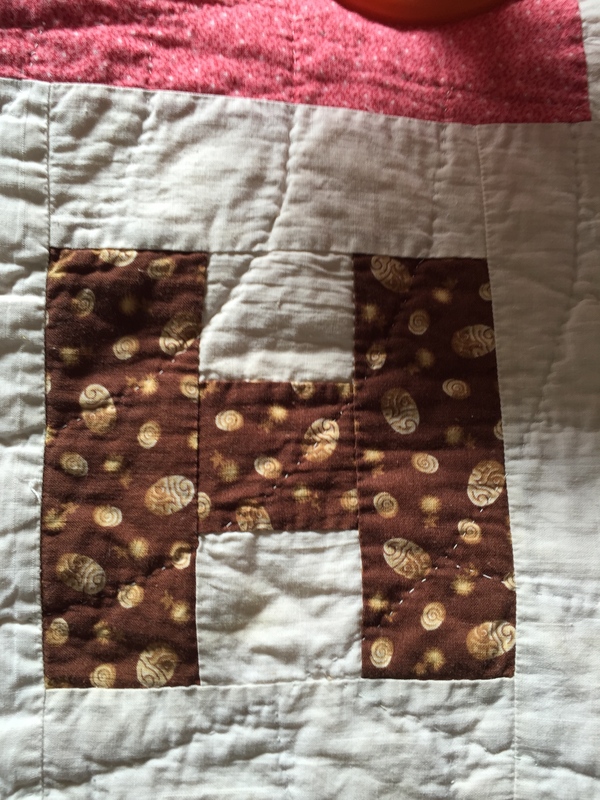 The Letter H quilt dates to about the late 1890s to 1910. 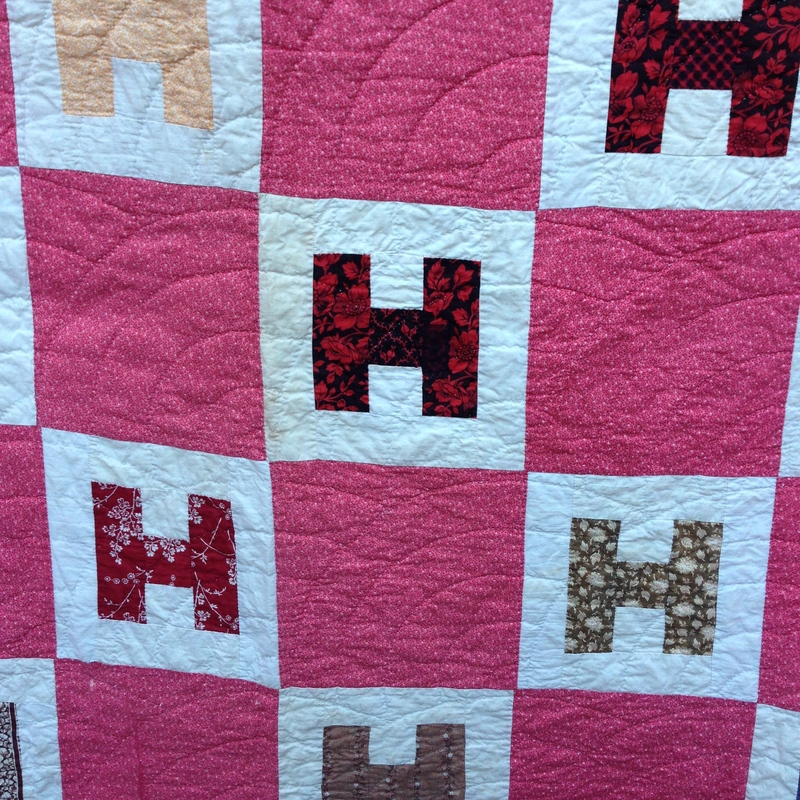 The Letter H blocks were probably made from the quilter’s scrap basket. 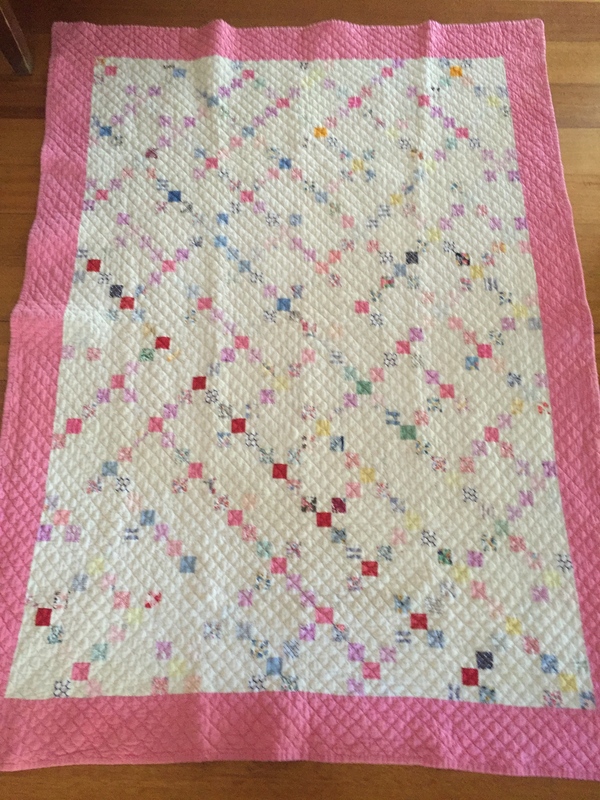 The cream background fabric in the blocks is consistent throughout, as is the gorgeous double pink used for the alternate blocks. The quilt has another double pink used for the side borders. The quilt measures 230 cms. (90 inches) by 178 cms. (70 inches) and the blocks are 24 cms. (approx 9inches) sq. The backing is a very pretty shirting with a pink on white design. The maker obviously ran short of fabric and joined in a similar shirting to create enough fabric for her backing. More of the pretty backing. The quilting is the Baptist Fan design and is executed in a loose, relaxed style. 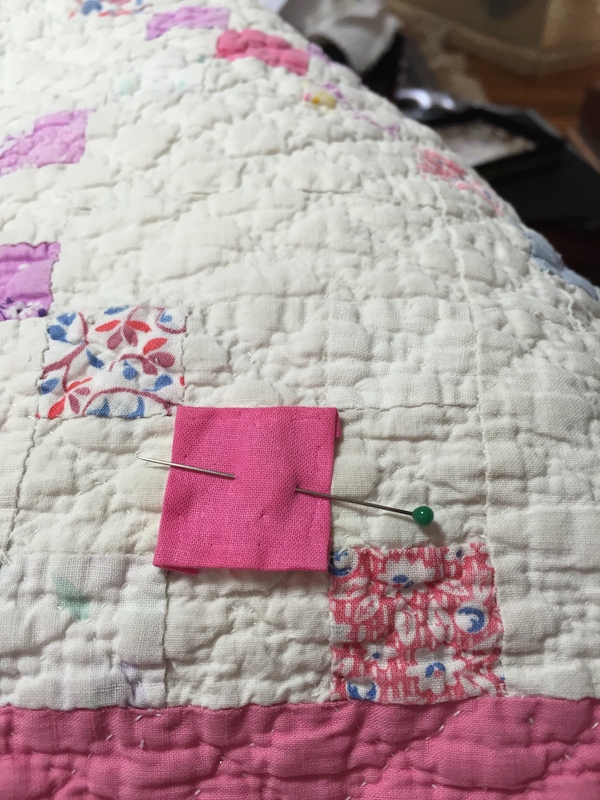 The quilter bound her quilt by bringing the backing fabric to the front of the quilt. The batting is a hand carded cotton. When I washed the quilt the little black cotton seeds were clearly visible when the quilt was wet. This quilt is one of my favourites. I love the design, the colours and the quilt’s tactile quality. So it really is never too late to mend. ” Mend in time; patch to a purpose; reinforce for strength and take care with all.” (quote from Mary Brooks Picken). Hope you enjoy the quilt and it’s story, Happy Mending – Janette – The Plain Needlewoman.